So I realize this post is super duper late because it is about Queen's Feast - Charlotte's restaurant week. It happens every year in late January, and Matt & I were super excited to take advantage. The concept of restaurant week is that you get a 3-course meal for $30 per person, so it's a nice excuse to try a fancy restaurant or two. Local readers who haven't done the restaurant week thing yet - get it on your schedule for next January! We decided to try Upsteam. I visited Upstream a few months back for a work lunch and the food was awesome, so I knew it would be a good choice for us to enjoy a 3-course meal. 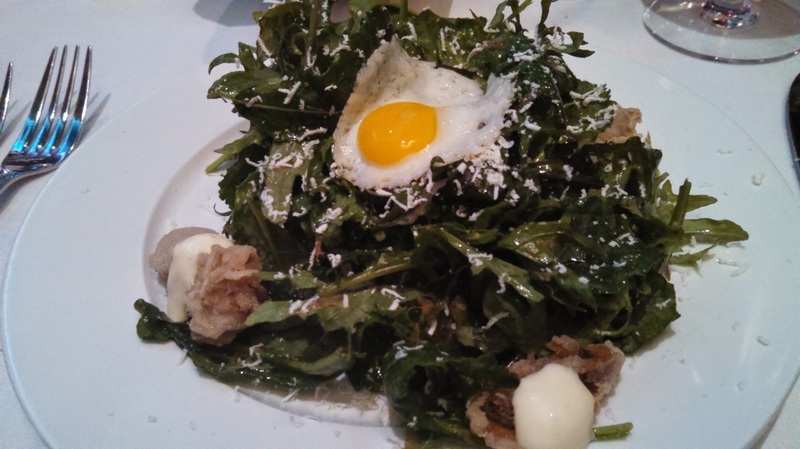 For my first course I tried the kale salad, it was topped with a fried quail egg, and came with fried oysters on the side. It was SO good. Next, I selected the salmon. 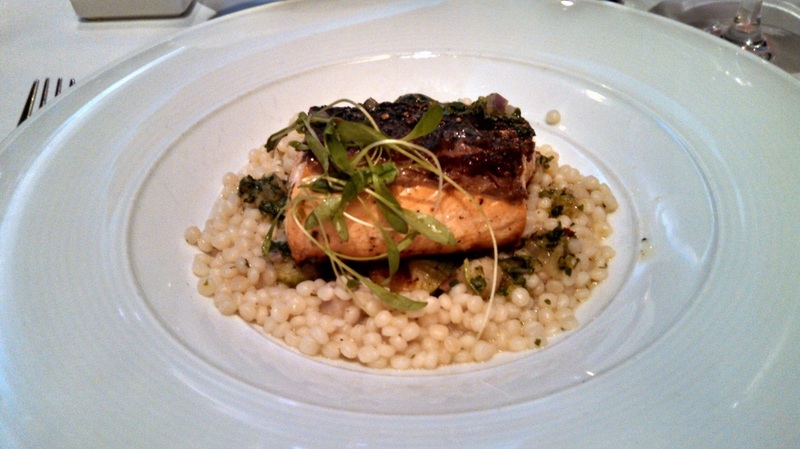 It was nice & crispy and came with a bay scallop risotto. How could that not be good? 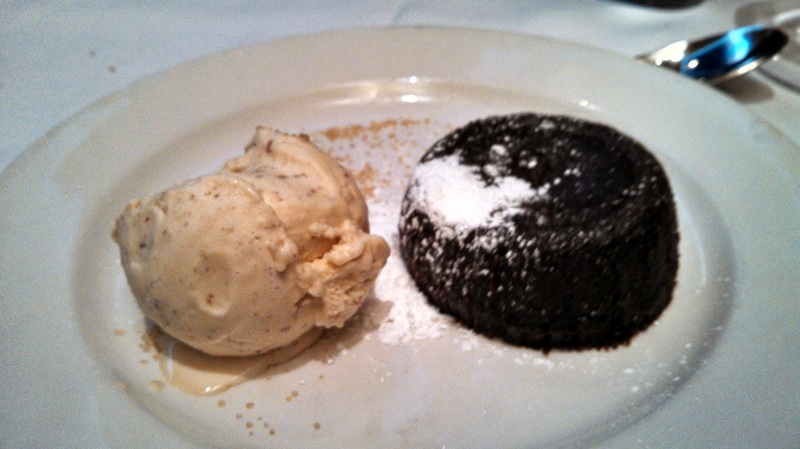 And for the indulgent part of the meal - chocolate lava cake. It was served with a side of gelato, but I can't remember the flavor. It was either caramel or hazelnut or something else delicious. This was SO, SO good. I could have eaten three servings of dessert and called it a 3-course meal, haha. And not I'll end with a fun little back story - Matt & I's first trip to Charlotte happened during restaurant week in 2011. That trip to Charlotte was the trip that made us fall in love with the city and want to move here. 4 years later- here we are as official residents visiting restaurant week again!! One of the great things about having a blog is being able to go back in time and see what you were up to during a certain point in your life. Over the holidays, my sister, my husband, and I were having a conversation about getting back on track health-wise, and it made me stop and think for a second. I feel like every single year for the past few years, the three of us have that same conversation. So I decided to take a look back at this blog from January 2014 - and low and behold I was writing about my weight loss plan for the new year. It's a vicious cycle my friends, and I hope that this is the year I finally break it. Confession time - I sort of knew that I was making terrible health choices the past few months. But let's face it, I spent a PHENOMENAL 3 months in Portland last summer, and an incredible 3 months in Europe this fall. It was 6 months filled with new friends, dinners out, and some of the most delicious wine I've ever had. I wouldn't trade it for anything. That being said - I am not pleased with the way my clothes fit, so it is time to get cracking. Hello January, let's do the weight-loss thing once again. I have been obsessed with these books and this philosophy for years. For those of you not familiar, Eat This Not That embraces the idea that with a few easy changes, you can cut calories and still eat delicious food. 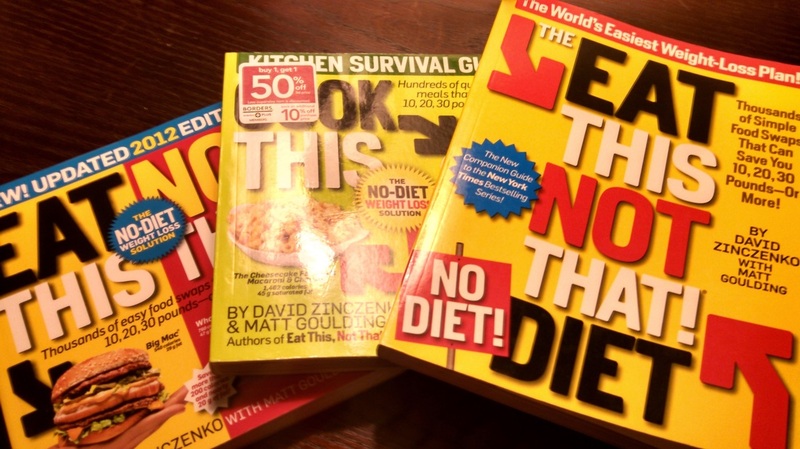 I love making recipes out of these books because 1) the recipes are typically really easy; 2) it lists exactly how many calories are in ingredients, and 3) the food is usually pretty good. So for my 2015 diet, I am eating about 1800 calories a day, and am mainly using recipes and recommendations from this book. I am planning on counting calories for a few more weeks until I get back into the swing of healthy eating. 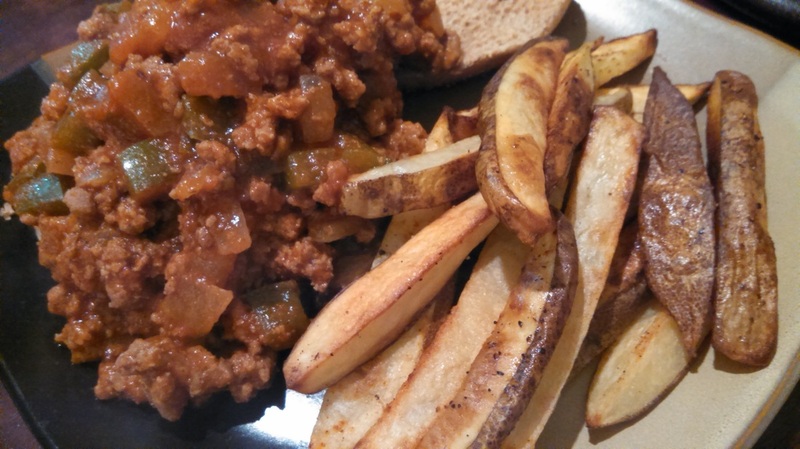 Tonight for dinner, I made the Turkey Sloppy Joes out of the Eat This Not That Diet book, along with a side of oven-baked french fries. Not a bad diet, eh? 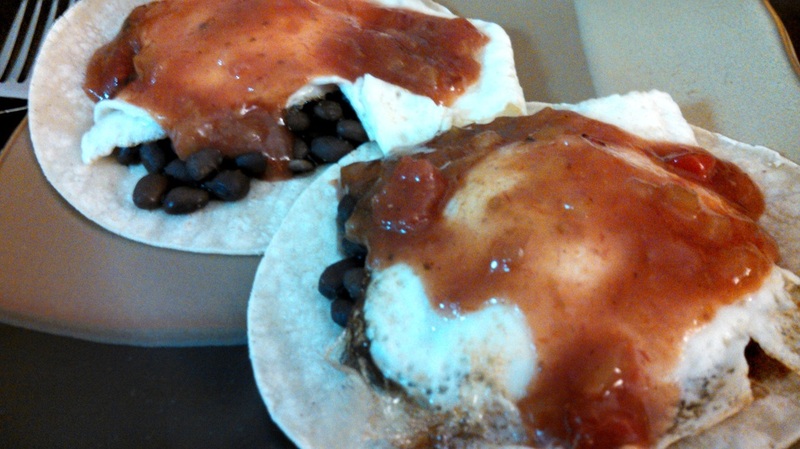 And earlier in the week: Easy Huevos Rancheros. I skipped the avocado, but the dish still tasted yummy. This is going to be my triple exercise threat. Okay, the dog walks are not really exercise, anyone who has seen my dog walk knows that we typically move at a snail's pace, but even standing burns more calories than sitting!! After dealing with some shin splint issues & my ongoing IT band problems, I am slowly making my way back into running. Last summer in Portland I KILLED IT, and had even gotten to the point where I was running over 4 miles at a time. But now, after barely running at all in Germany, I am starting off slow to try to remain injury free. I am planning to run twice a week for now, and the increasing it to three once it gets lighter & warmer outside. And yoga is always part of my routine. I plan on going 1 or 2 times a week, depending on my schedule. Once a week, Matt & I are going to indulge by going to a restaurant. 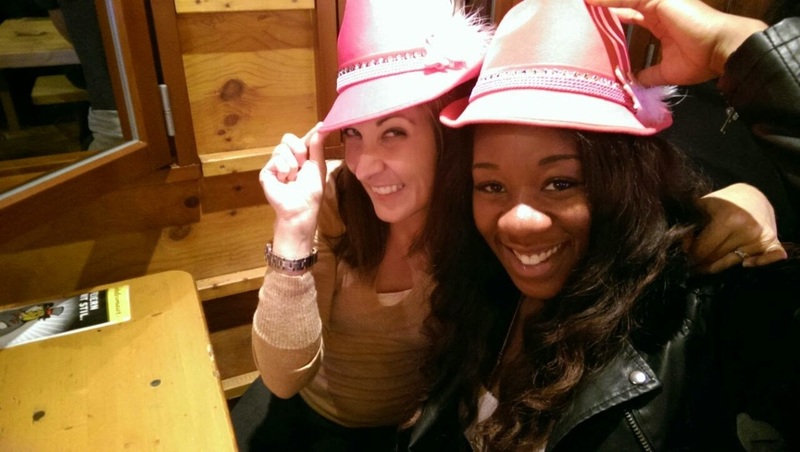 We typically do this - it is not realistic to sit at home and never enjoy a dinner out. Especially because there are so many exciting restaurants to try in Charlotte. So, who else is doing their yearly January weight-loss routine? Who else wants to break this cycle? Who will join me in meeting their goals? It's hard to believe that today is January 11th, the past few weeks have FLOWN by. It has been action-packed my friends. Here are a few highlights. December 13-14: Return to the U.S.
After spending 3 amazing months in Germany and a week in Paris with Matt, it was finally time to return home to Charlotte. 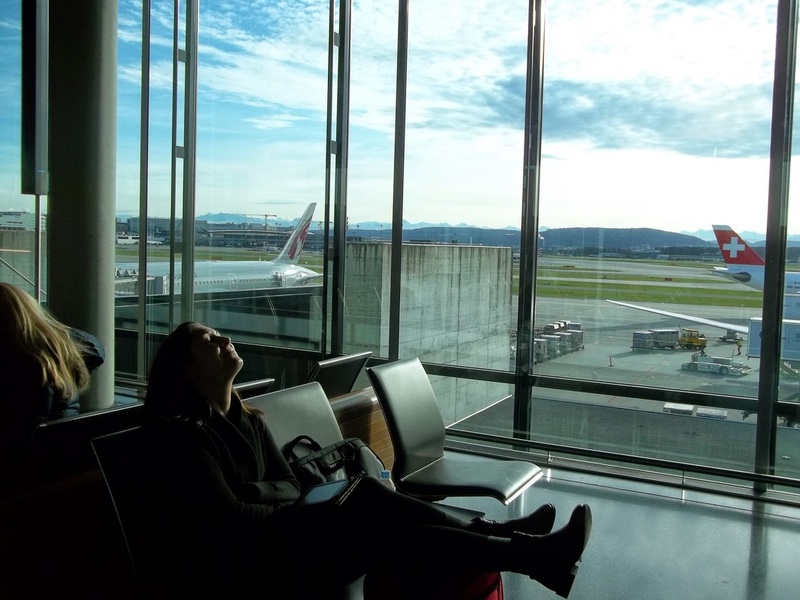 The trip home was NOT easy, extended layovers, missed flights, complete exhaustion. Worth it? Of course. 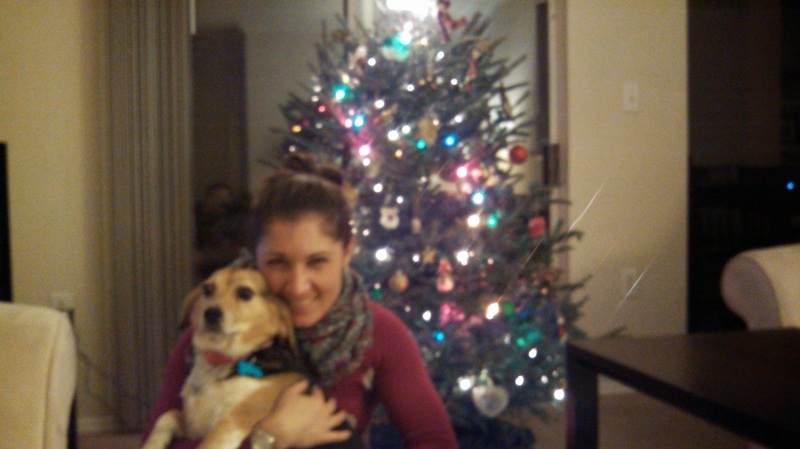 One of the best parts about my return home was reuniting with my baby girl, Sadie. I missed her SO much. For those of you who have met Sadie in person, you know she always looks like this and was probably actually happy to see me, haha. December 15 - 25 Prepare for Christmas! It seemed insane that once I got home it was already time to start preparing for Christmas. But the first matter of business was to have a proper Mexican meal, the Mexican food was severely lacking in Europe. I went to one Mexican place in Stuttgart, it was not the same folks. 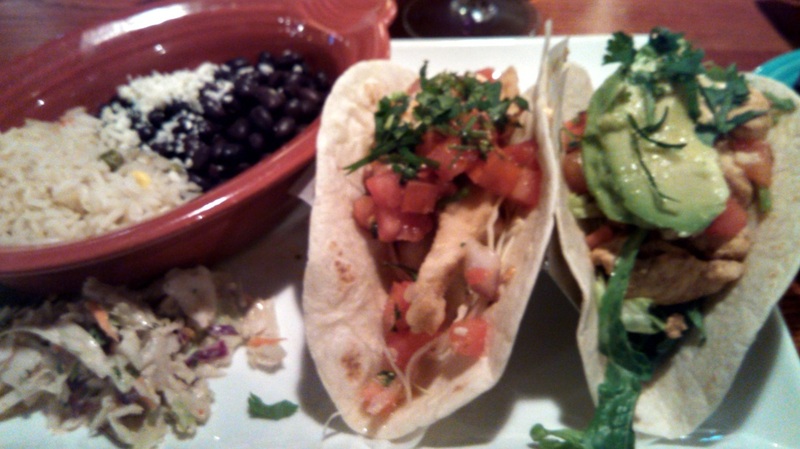 Below are tacos from Cantina 1511. I recommend the place, but make a reservation it was SUPER crowded! And then of course we had to buy and decorate our Christmas tree. Snagged one from a lot on December 21st, better late than never! As usual, Sadie looks unimpressed. This was actually the first year ever that Matt & I had a quiet Christmas at home, and it was really relaxing. We watched Christmas movies, cooked some food at home, and... one of the perks of spending Christmas in the south... even went for a Christmas jog outside. The few days at home came to a quick conclusion though, because then it was off to Ohio to visit my family. I think the trip to Ohio helped me with the transition, since this was the first year I wasn't with my family on December 25th. At least I got to have the house-full-of-people holiday experience I like, even if it was postponed. Thankfully it wasn't TOO cold in Ohio during the time that I was there, and it was nice to see my grandmother, my parents, and even my sister and her husband since they were visiting too. I got some shopping done, ate my dad's traditional Christmas breakfast, and even got to see some of my girlfriends. Since I didn't have Sadie with me, the only times I needed to be outside in the cold Ohio weather were to walk to & from the car! 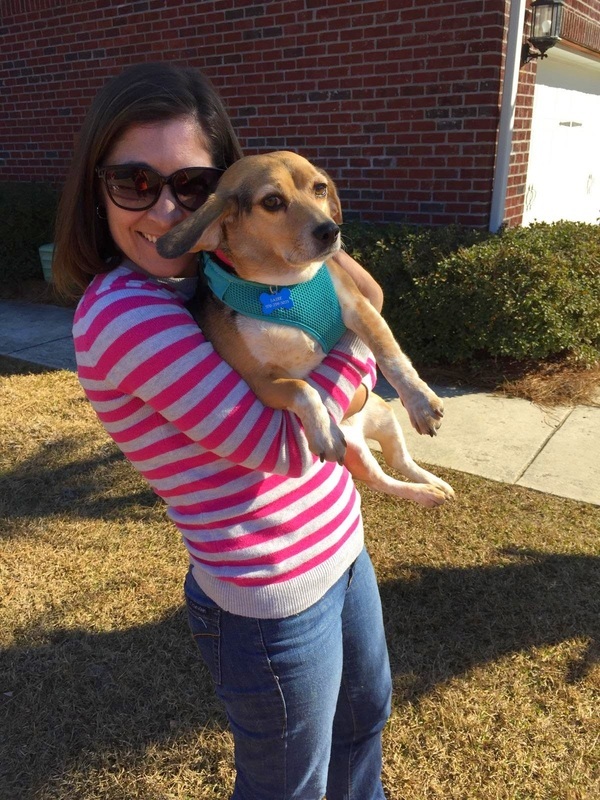 The whirlwind continued with a trip to Charleston to visit Rachel & Matt, and spend New Year's Eve with them. We played games, ate some Mellow Mushroom pizza, and despite being exhausted, even managed to stay up until midnight! Ha! New Year's Eve in your 30's is never quite as crazy as it was 10 year ago. 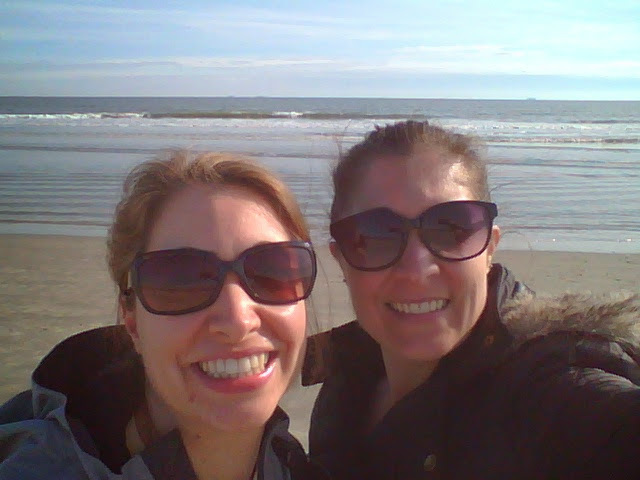 The best part about spending New Year's in Charleston was that the weather was fantastic, so Rachel & I took advantage of going to the beach. It was a little chilly, but the sun was shining and the beach was SLAMMED. There were a ton of other people there taking advantage too. As you can imagine, after the 3 months in Europe, the crazy holiday schedule, all the yummy food I have been eating, the past week has been focused on getting my diet back on track. More to come on that later, I'll share what I'm doing and some healthy & easy meal ideas. In other food news: Charlotte Restaurant Week is coming up, and Matt & I have some delicious dinners planned - don't worry - I will fit these into my diet! Remember, it's all about balance, right? Happy New Year! 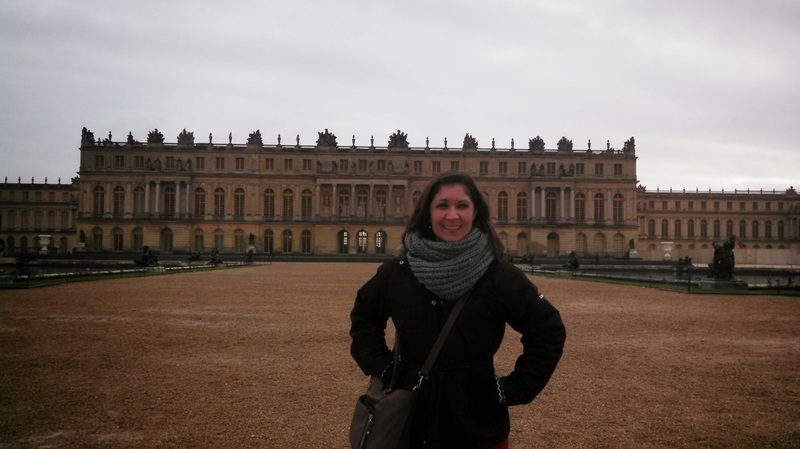 Now that I am back in the U.S.A.; I can't think of a better way to start the year than to recap one of my favorite European travel destinations: Paris. 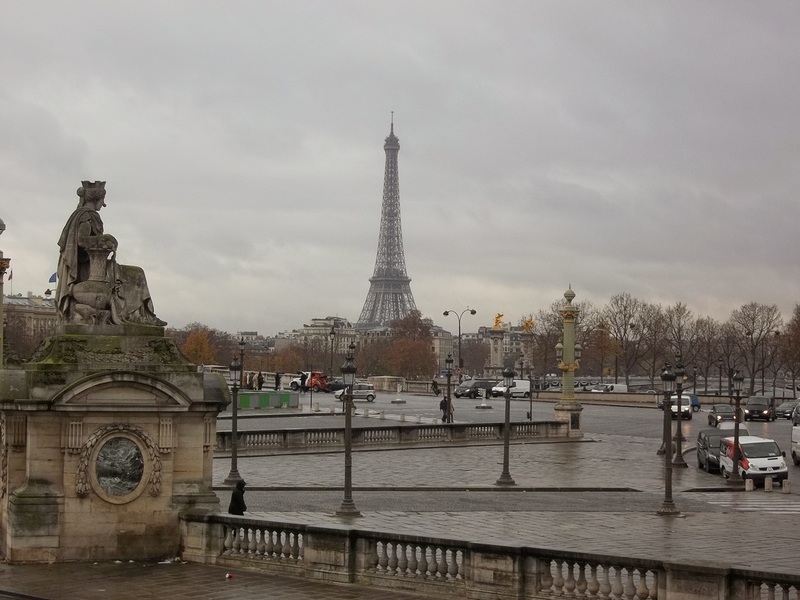 Paris was absolutely spectacular; the weather, not so much. Most of my photos are gray and gloomy. Matt & I both loved the city, imagine if we would have been there on a beautiful summer or fall day! 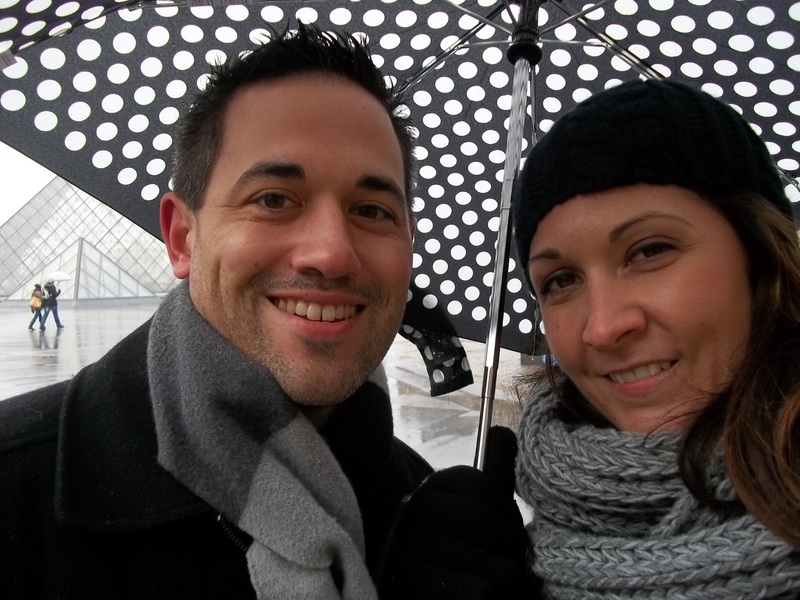 It was still amazing to see the sights, and even with the rain and cold we still got out there to have some fun. 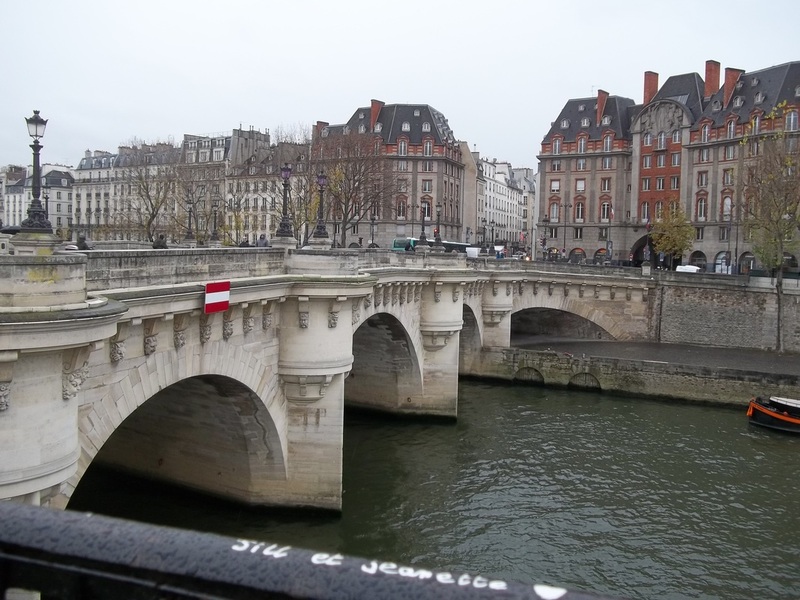 There is SO much I can write about Paris, we really jammed a lot of sightseeing into four short days. But since this is a food blog, I will stick to some of the yummy stuff I ate and drank. And then a few scenery pics!! The European lifestyle is one where people wake up late and eat a leisurely breakfast, so a lot of times we weren't hungry for lunch until around 2 or 3 pm. On those days, we ended up skipping a big dinner and just having some nice wine and perhaps an appetizer. We did make sure to go to one dinner - and chose La Fontaine De Mars. 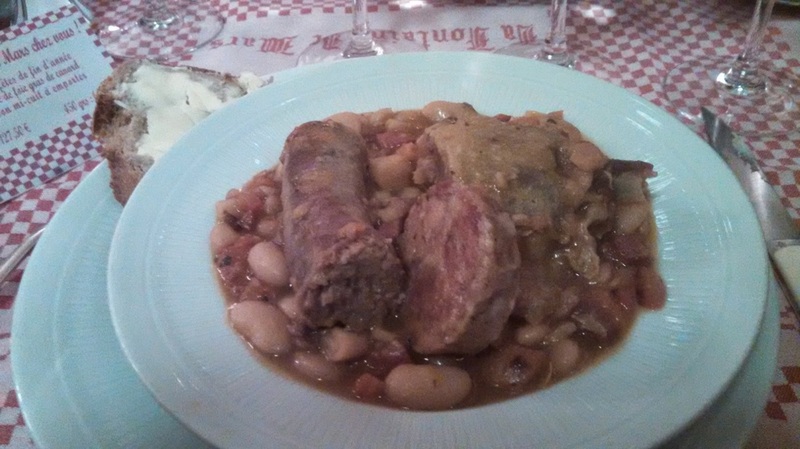 I decided to go WAY outside my comfort zone and order a French classic - the Cassoulet. It had big chunks of sausage and duck. The sausage was a bit much for me, Matt ended up eating a bunch of it, but I actually ended up liking the duck. Who would have thought? 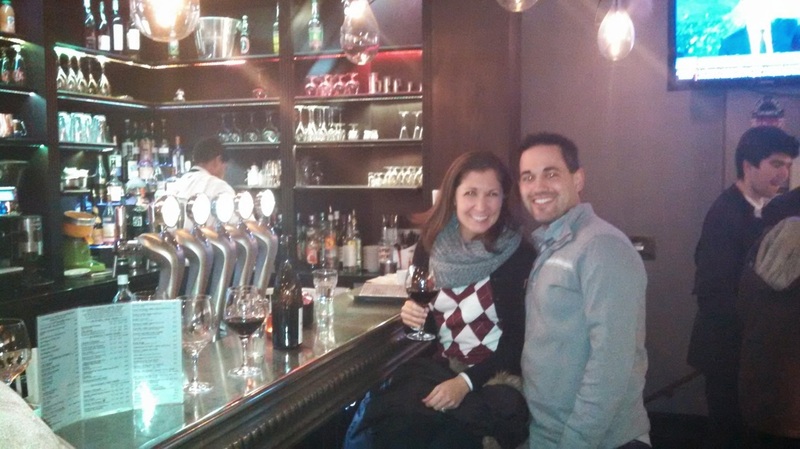 Lots of delicious red wine was consumed in Paris, the bordeaux was amazing. Here we are enjoying a nice bottle in a neighborhood bar near our hotel. 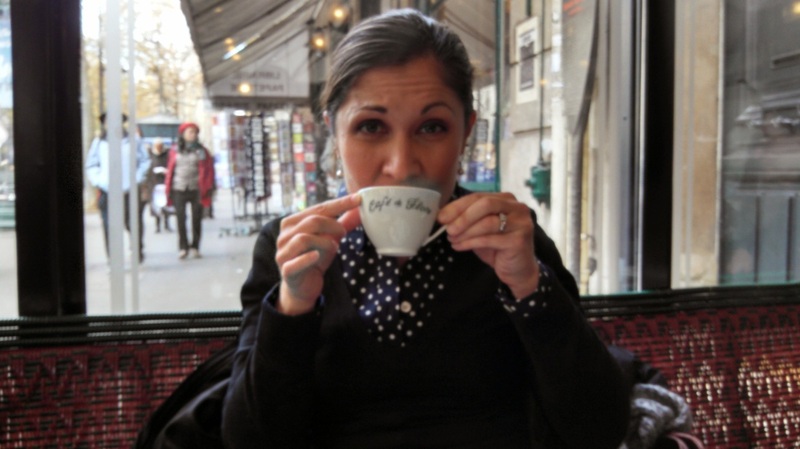 And of course one cannot visit Paris without having a lot of coffee and pastries! One of the unique things about Paris is that a lot of the cafes are really old, and the average tourist can end up sitting in the same restaurant that French artists, politicians, and historic figures may have sat in the past. One of the most famous cafes in the Cafe De Flore, so we popped in to escape the cold and enjoy a coffee. So, okay, those pastries are not from Cafe de Flore. I don't remember where we got them. But holy crap were they delicious. Flaky crust, cheese filling, sweet almonds on top. Delish. 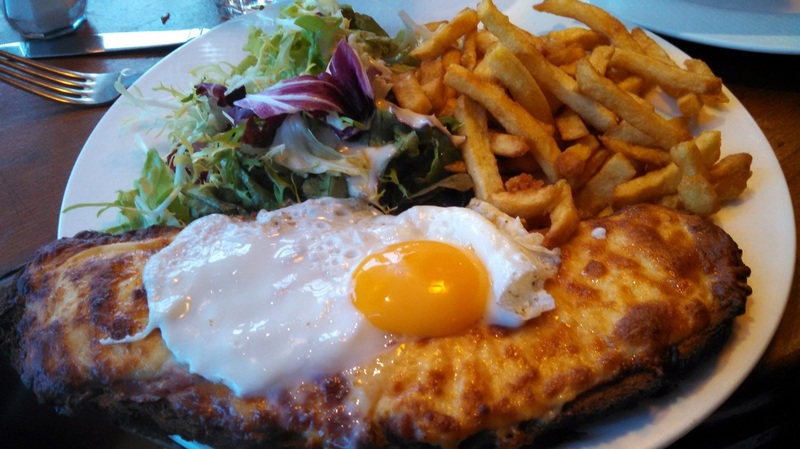 Another yummy Paris delicacy is the Croque, it's essentially an open-faced ham & cheese sandwich. I enjoyed this meal at Cafe Panis, near the Cathedral of Notre Dame along the Seine river. This was on one of those 3:00 pm lunch days, so this huge sandwich and a nice glass of red was exactly what I needed on a cold, rainy day! Of course, these were not the only meals I ate in Paris, but were some of the best. And now I'll leave you with some scenery to enjoy. If anyone gets a chance to visit Paris - take it! Even in terrible weather it is a must-see destination. During my first trip to Germany last fall, I was in a work-conference setting with a large group of colleagues, and one of our meals during the conference was a boxed lunch. I remember choosing the vegetarian boxed lunch option - and I couldn't believe the sandwich they provided when I opened the box. It was simply butter, cheese, and a few herbs on a roll. I remember thinking how strange it was to eat a cheese & butter sandwich. It's hard to believe that now, a year later, I love this type of sandwich! Coat each slice of bread with a good amount of butter. Layer on cheese, egg, tomato, and cucumber, sprinkle with a bit of pepper. 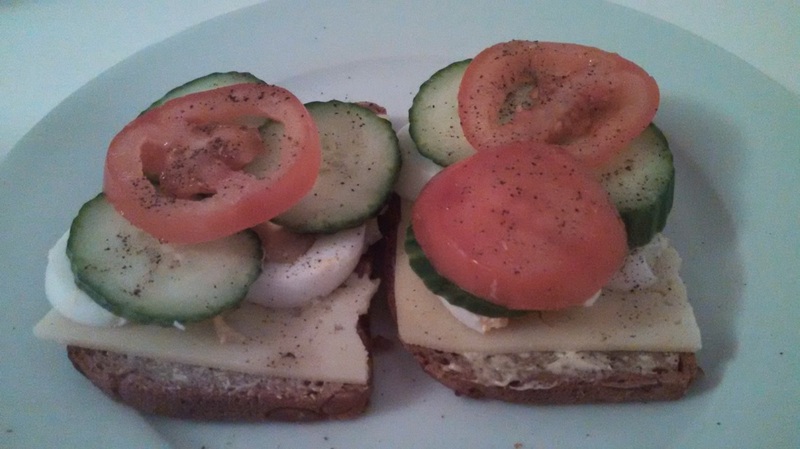 Close up the sandwich & enjoy, or be a true European and eat it open-faced! For my American friends, the true star of this sandwich is the bread. The bread in Germany is delicious. You cannot use American-style "Wonder Bread" type bread for this, you need something with a hard crust. It can be a roll or sliced bread, but it needs to have a nice nutty flavor. I am thinking when I get home to the U.S. I will have to find a German-style bakery somewhere, or even visit a farmer's market and look for an artisan bread. Because I am now addicted to these sandwiches!! Greetings friends! 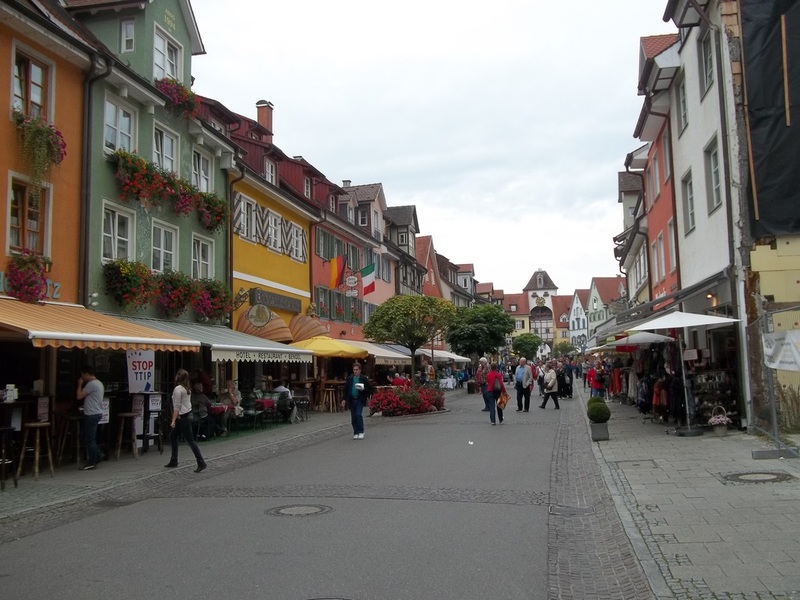 It's hard to believe I have been living in Germany for 2 months now, and have only 1 short month to go. A few weekends ago, I got to spend a whirlwind weekend in London - it was so nice to be surrounded by people speaking English again. Ha! It was amazing to see all the sights you always see & hear about on TV & movies, but perhaps even nicer for me was having the chance to spend a weekend with some good friends & family. 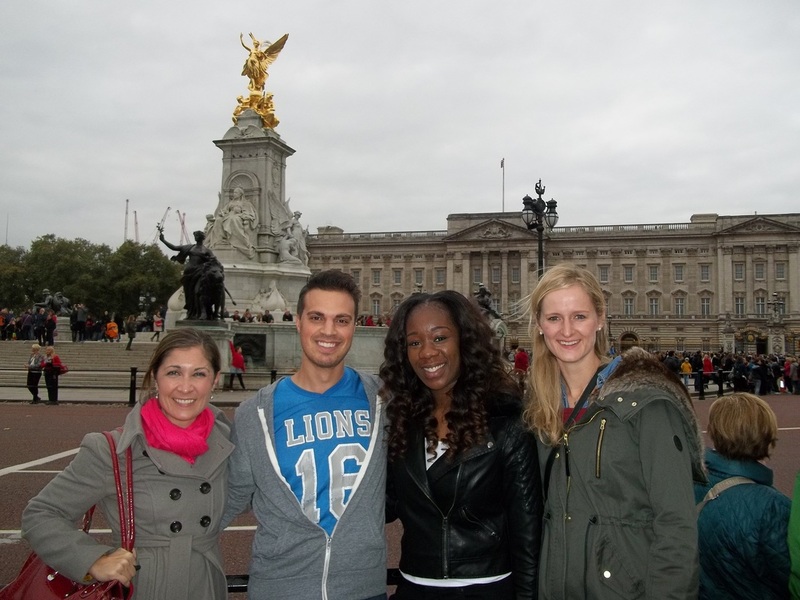 Through my job, I have built up some close friendships with people all over the world, and London is no exception. There are five good friends of mine that live about 1 hour outside of London in a town called Milton Keynes. 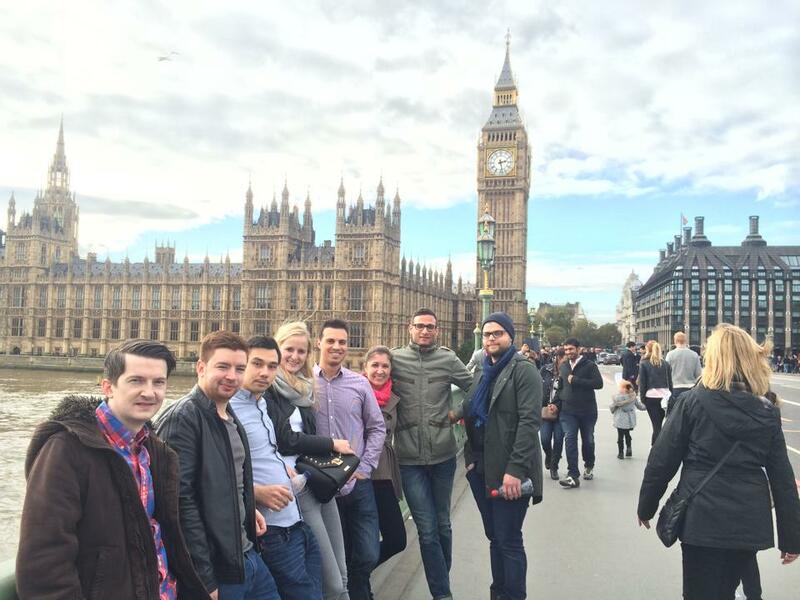 On Friday when we arrive at the Heathrow Airport, we immediately headed to Milton Keynes to meet everyone. Loved it! After staying out way too late on Friday night catching up with these guys, we headed into London on Saturday morning for sightseeing of course! I have definitely embraced being a tourist and walking around new cities with a pack of people. 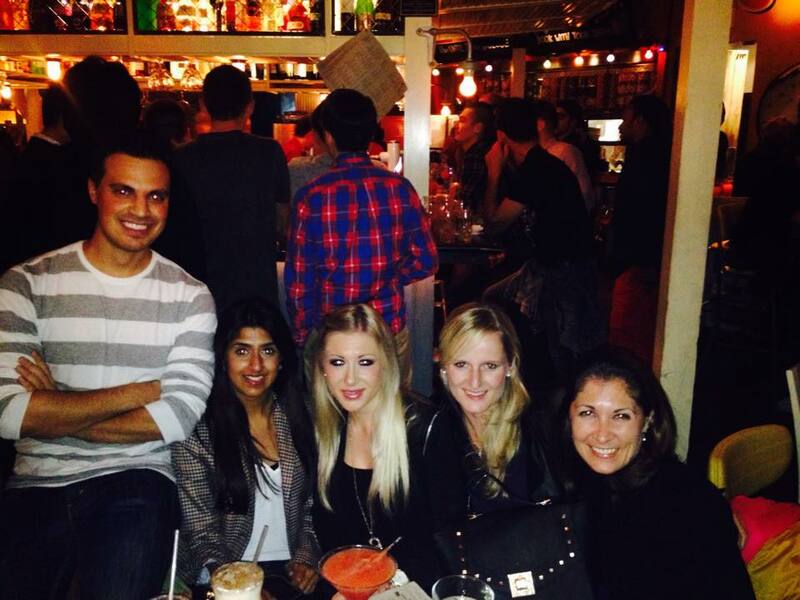 Germans, Americans, Brits, it was definitely an international weekend! After a long day of sightseeing, we went to get a "proper curry" (as the British say!) for dinner. Curry is a popular dish in London, it is not all just tea and fish & chips! Unfortunately I didn't take any dinner photos, I only carried a small clutch with me for going out at night, and there wasn't room for my camera. Blogger fail. 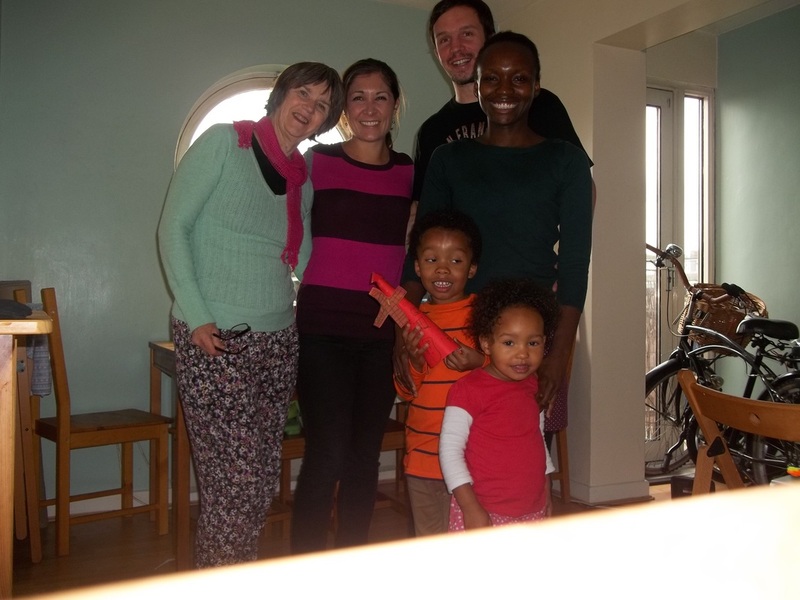 On Sunday afternoon, I also had the chance to meet up with my cousin Andrew and his wife Sheila - Andrew moved to London years ago and I finally had the opportunity to visit Andrew, Sheila, and their kids! By a fun coincidence, my aunt Donna was visiting them too at the same time, so I got to see several family members. 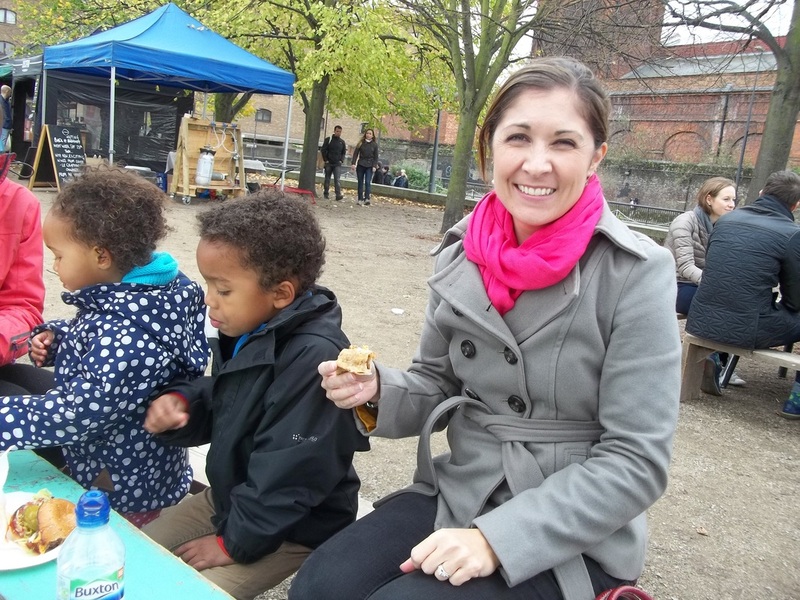 We walked to a small outdoor market near their apartment to get some lunch and take a look around. It was really a fantastic weekend! I got no sleep of course, there was too much to see & do! 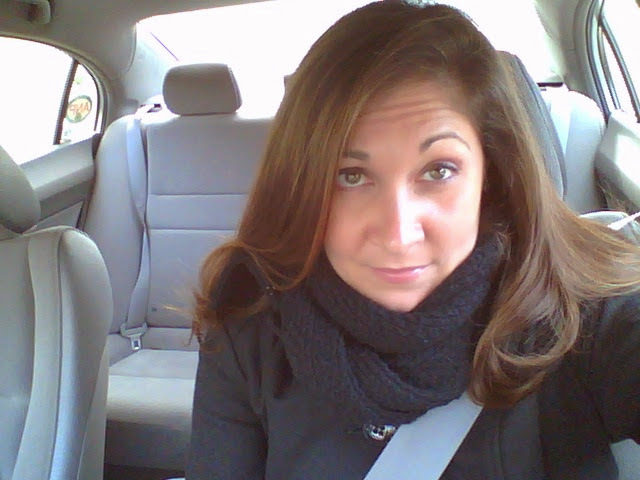 I love how my mother told me that I look "cold and tired" in my photos. Very true... !!! But definitely worth it. I want to take advantage of every minute that I can while I'm exploring these new cities. The Euopean travel schedule continues! I have had some amazing weekend journeys so far during my stay in Germany, and there will be many more to come. 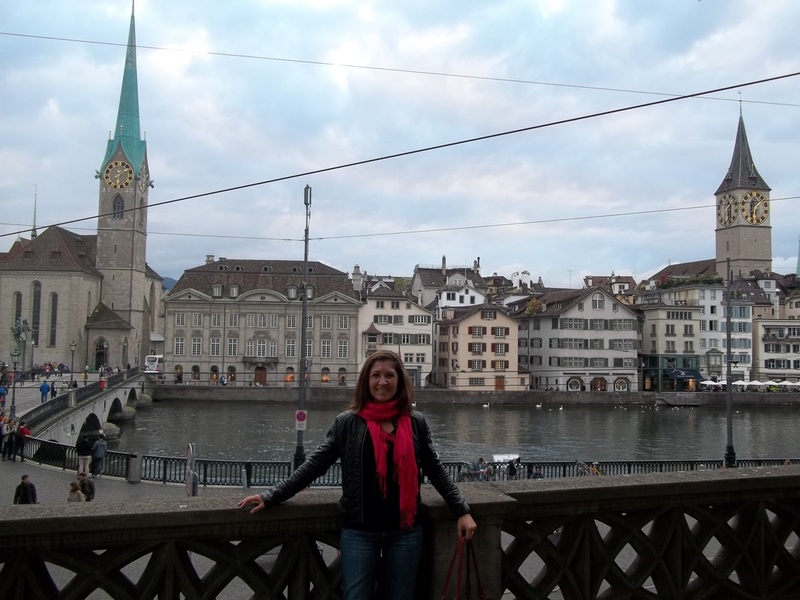 Here is a recap of the past few trips: three countries in two weekends! I still can't get over the fact that is is so easy to travel between countries here. 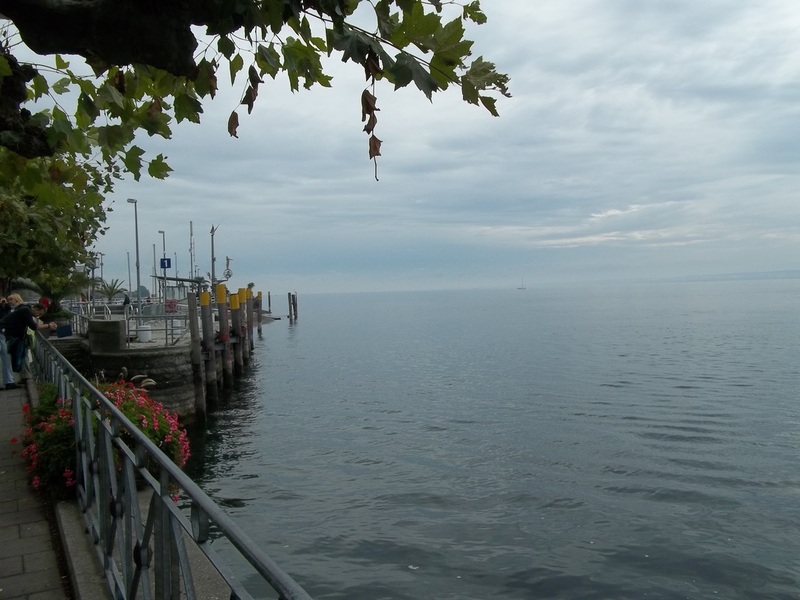 I am accustomed to the Fort Knox-style border patrol that comes with getting in & out of the U.S.
Nestled in the south of Germany is this lovely lake: Konstanz. It is supposed to be on of the prettiest sights in the country, so of course we needed to stop there. Since the weather is getting a bit cold, there was no swimming or soaking up the sun involved during this lake trip, but we did have a nice lunch by the water and took a walk around the food/restaurant area surrounding the lake. Super cute. After lunch, we took a ferry ride across the lake and continued on to our next destination of the day - Zurich, Switzerland! 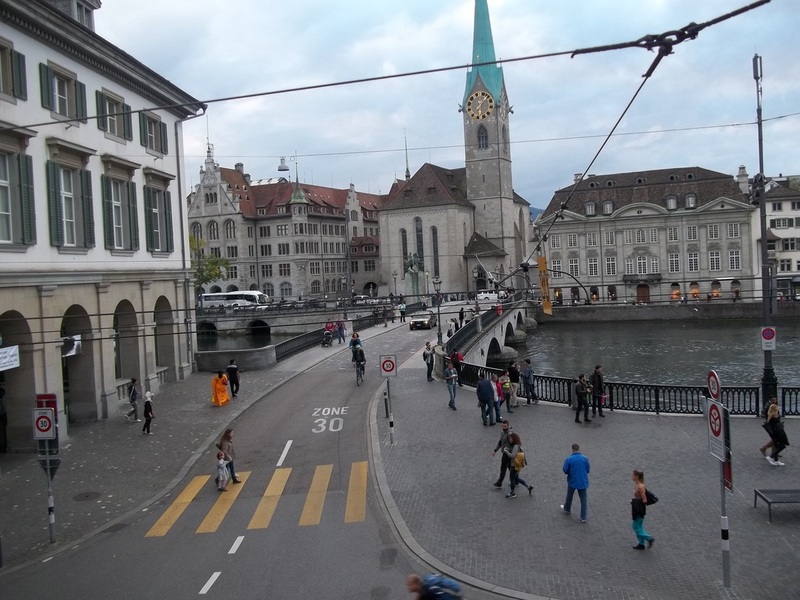 Zurich was really pretty - but the first thing everybody says is how expensive it is there. To be honest - I had no comprehension of how much things were. 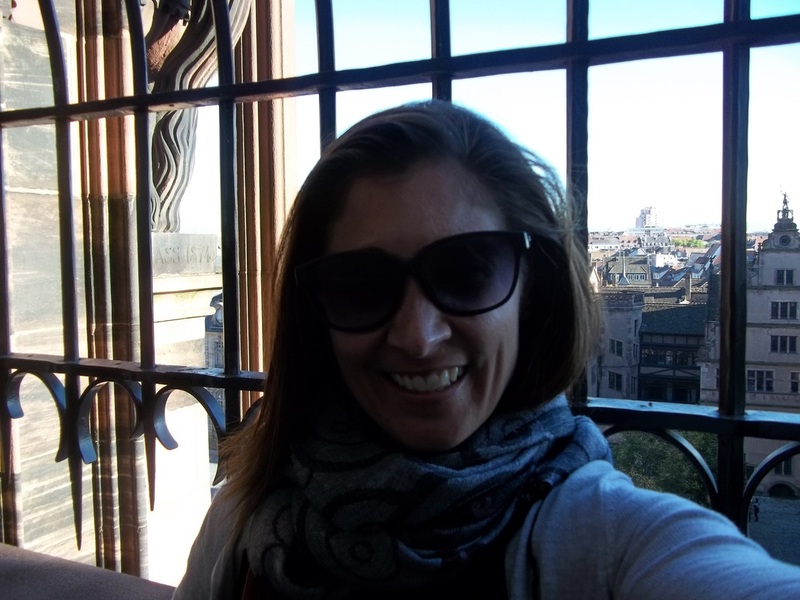 Since we were only on a day trip and had just eaten lunch at Lake Konstanz, the only thing I really bought in Zurich was a glass of wine (of course!). I imagine one of these beautiful apartments by the river is quite pricey though. 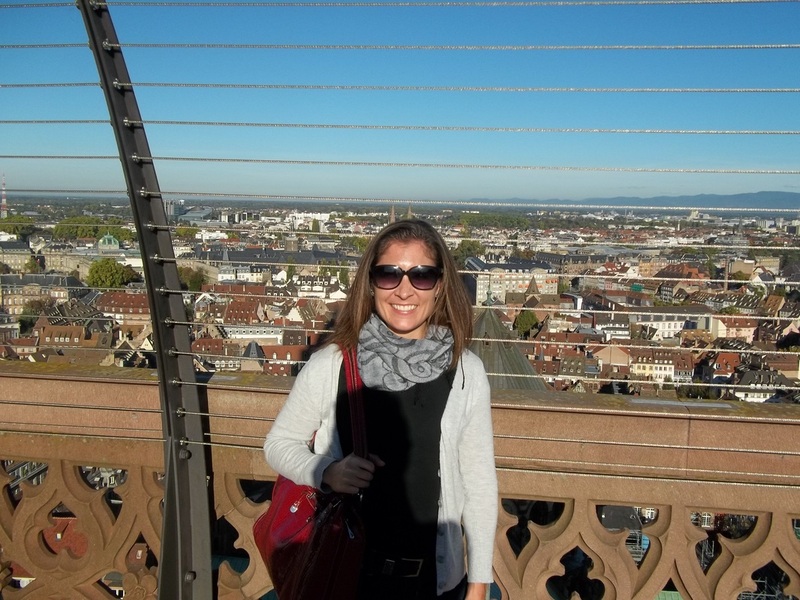 On the schedule the following weekend was Strasbourg, France. Typical American - I had never even heard of this city until I arrived here. I loved it. The scenery was beautiful, and it is only about a 2 hour drive from Stuttgart, where I am based. Well... it should have only been a 2 hour drive, but we got completely lost. 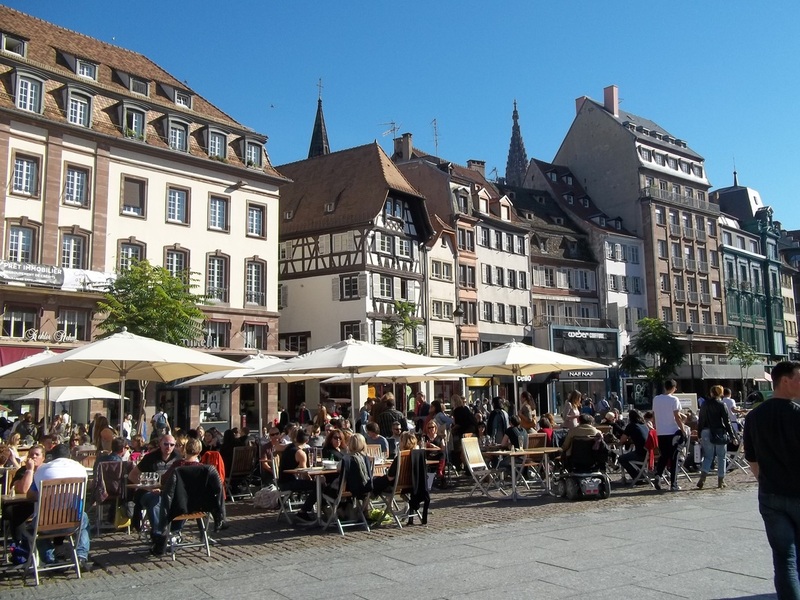 Did you know there is also a Strasbourg in Germany? Neither did we. Our GPS apparently knew though, and directed us there. #roadtripfail. When we finally arrived in Strasbourg, we were all starving. 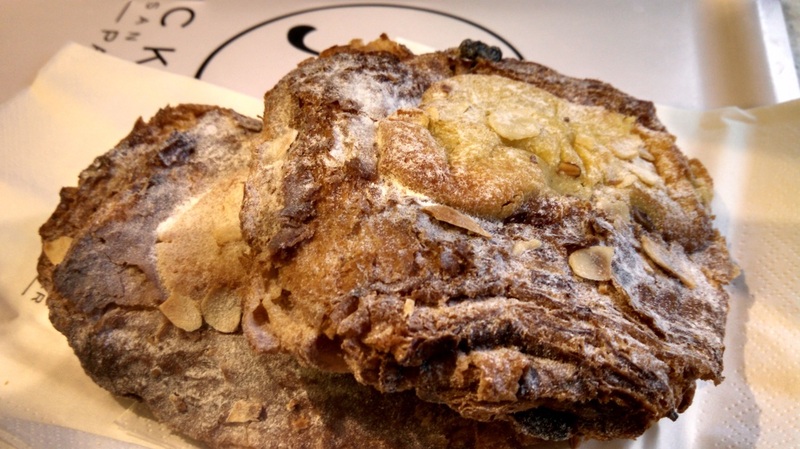 The first stop was to a local cafe for "Tarte Flambee", a special food from this region of France. Since Stuttgart is so close to Eastern France, they serve this in many German restaurants as well, and it's called "flammekueche." 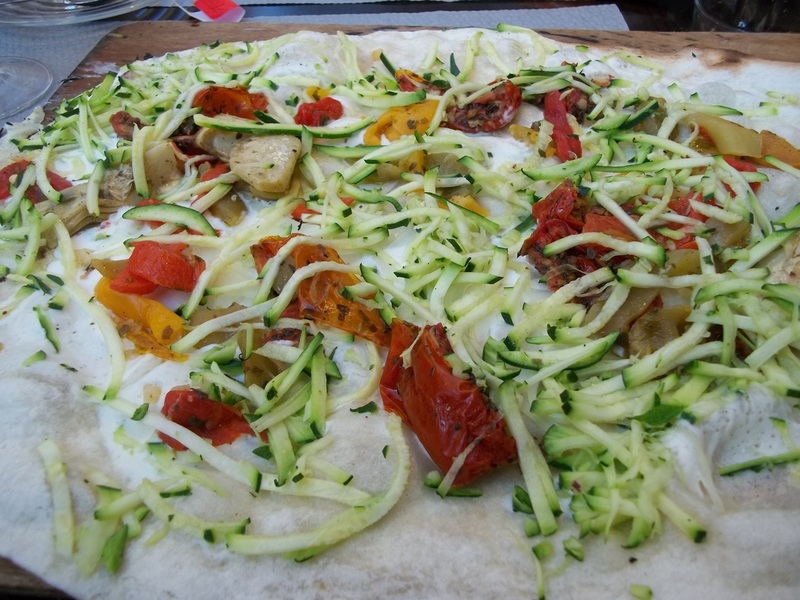 It resembles a thin-crust pizza, but the dough is really, really thin. Almost like a cross between a pizza and a tortilla. I devoured almost this entire thing, along with a nice glass of Pinot Noir. The traditional version of Tarte Flambee comes with cheese, onions, & bacon; but I opted for this vegetarian version instead. :) Delicious. After lunch it was of course time for sightseeing. 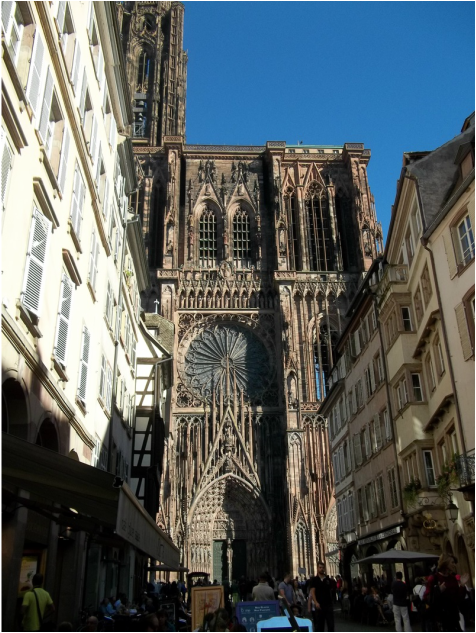 The top tourist attraction in Strasbourg is the Cathedral of Notre Dame. Beautiful. And FINALLY at the top! Totally worth it, the view was spectacular. I wish my bad photography skills could do some justice to how gorgeous these cities are. One of my favorite things about Europe is the fact that you can usually find people relaxing in these outdoor public squares. It is so enjoyable to relax and sip a glass of wine or have a nice afternoon cappuccino. Luckily I have been able to experience this European tradition on all my city visits. Au revoir for now friends, more adventures to come! I am hoping to write a bit about each of the places I visit while I'm in Germany, and unfortunately I am already falling way behind! A full weekend travel schedule has been booked for my 3-months here, I want to make sure I am taking advantage of my time in Europe. It is so easy to travel around to different cities and countries; things are much closer together than they are in the US! 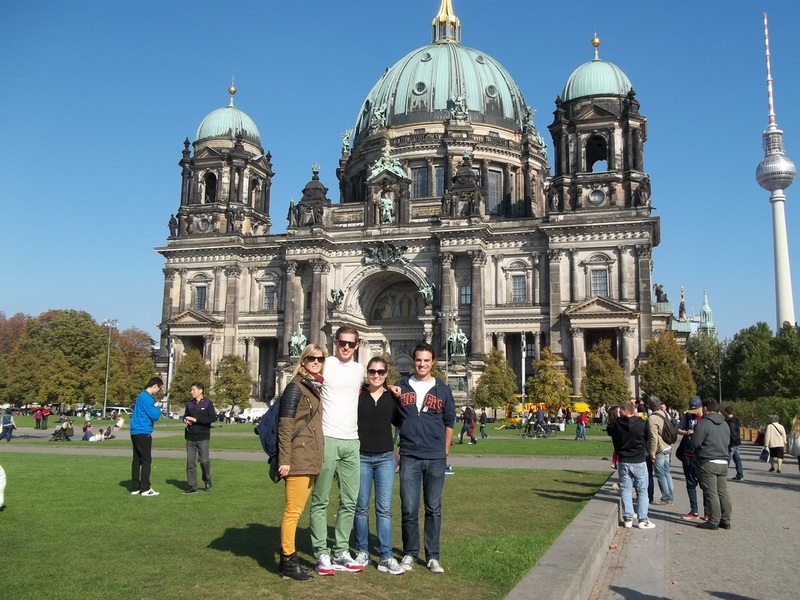 After spending the first weekend in Stuttgart at Oktoberfest, my travels began with a long weekend in Berlin. 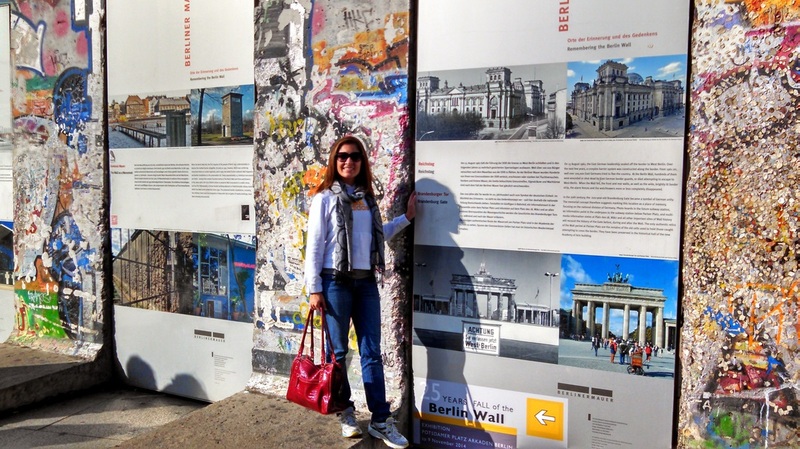 October 3rd is a holiday here in Germany, so it seemed like the perfect weekend to book a road trip to Berlin. 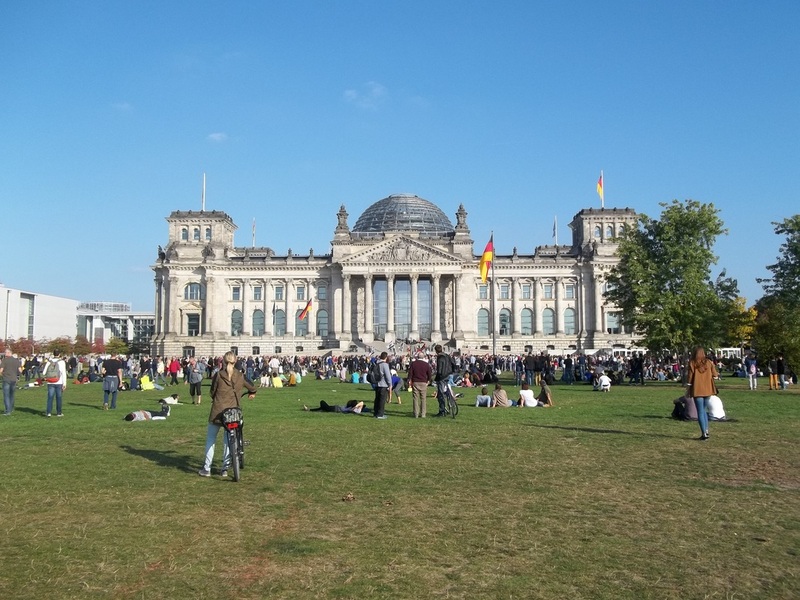 In fact, I didn't realize how perfect the timing was (shame on me for not knowing my world history), because the October 3rd holiday is German Unity Day, the anniversary of East and West Germany reuniting in 1990. What an excellent time to be in the country's capital. Luckily, I have a good German friend who is familiar with Berlin, so he and his girlfriend joined another American friend and I for the weekend. 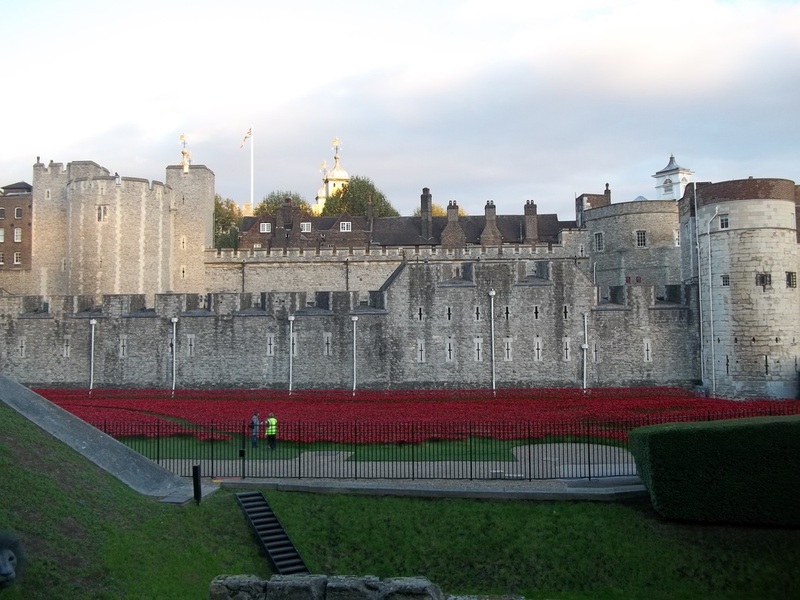 It was so nice to have a local who was familiar with the city, we were able to see and do so much more since he knew all the hot tourist spots to hit along the way! Yes, I realize I am wearing sneakers and look like a complete American tourist - Matt already made fun of me when he saw my photos. But seriously you guys, we did SO much walking around, there is no way I could have handled it in uncomfortable shoes. With that being said, I decided the white running shoes may be a bit too dorky, so I bought some casual black Adidas shoes for future trips. Ha!! One of the things I find fascinating about Europe is that there are so many old buildings and historic sights everywhere, but among those old things are new buildings and tourist attractions. Like here, I am standing by a section of the Berlin wall that is remaining in the city, but gross people have stuck gum all over it, and they covered part of it with informational plaques. We did manage to find some time to relax in Berlin too, it wasn't ALL sightseeing. 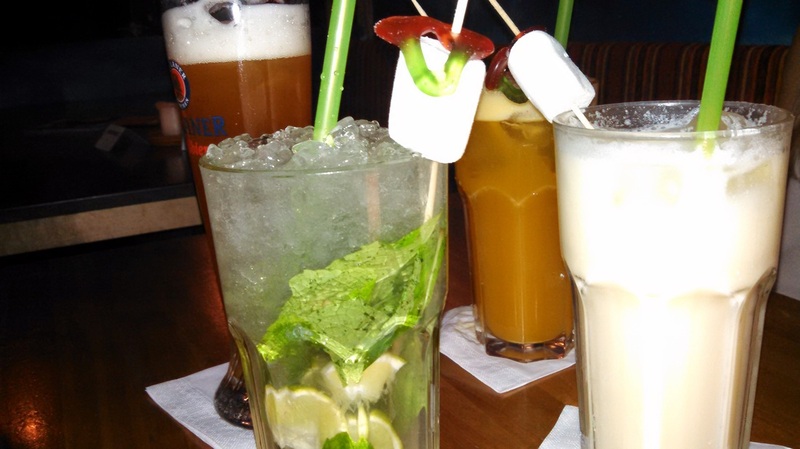 The weather was gorgeous, so we made some time to pop into a really cool bar in East Berlin and have a drink. 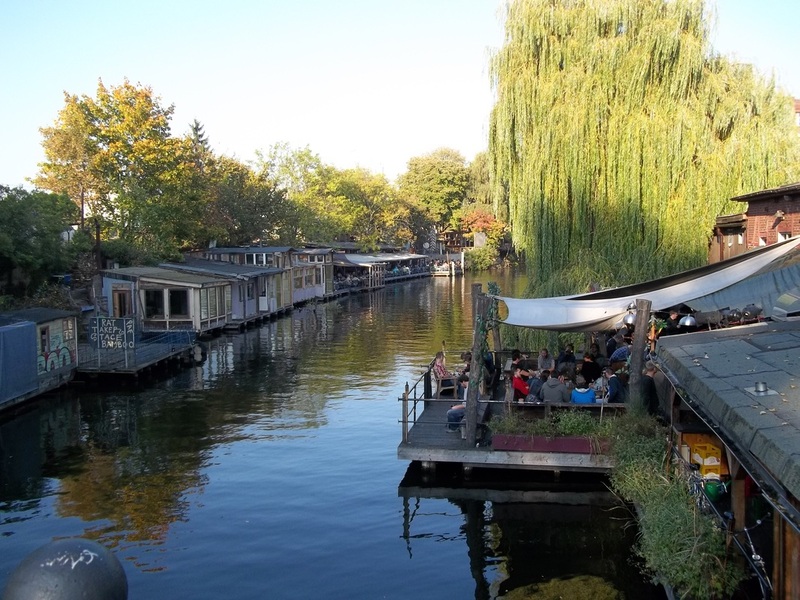 Here is a snapshot of the bar from a bridge, it sits right on the water and you can watch people floating by on paddle boats. 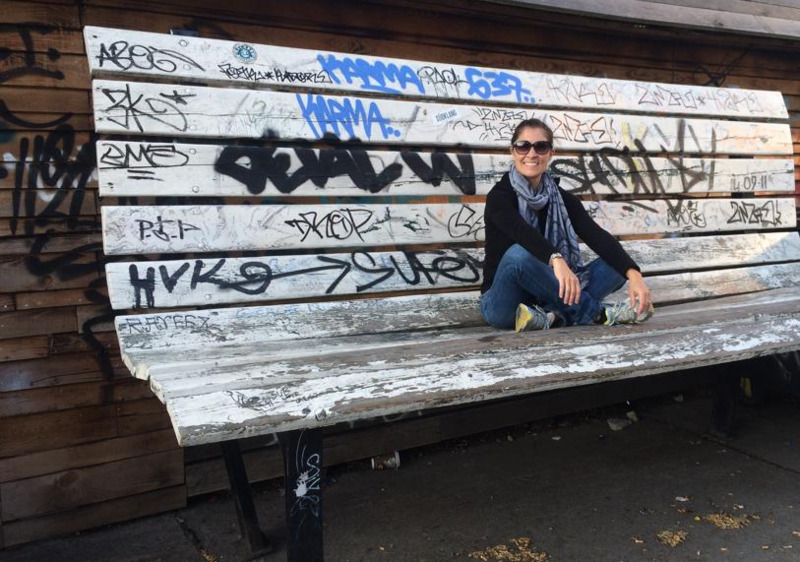 Berlin is super casual and has an alternative/hippy vibe, which was fun to experience. I can't say that it's my usual scene (too many hipsters!) but for a change of pace it was pretty cool. 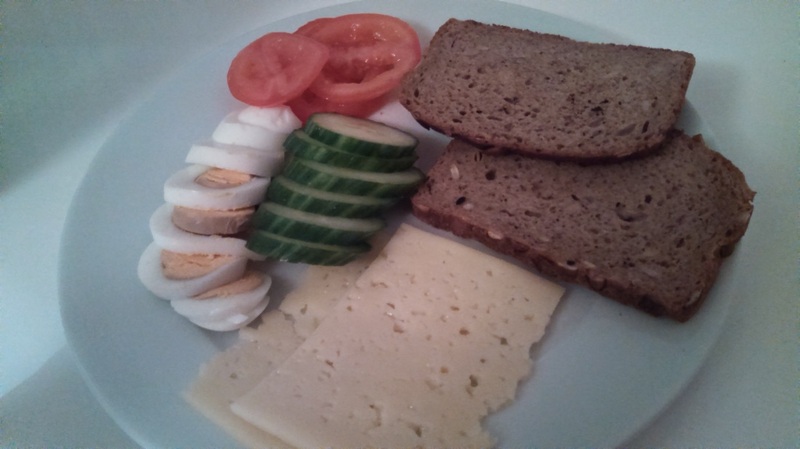 So, what have I been eating while in Germany? I've gotta tell you, it varies dramatically from day to day. It is not easy to prepare food for myself. First of all, my kitchen here is tiny. I do have a small oven and stove, but when I first arrived here I didn't have a microwave or a coffee maker. I did manage to remedy these problems by buying a cheap coffee maker and persuading my landlord to let me borrow an old microwave, but the kitchen situation is still not idea. Secondly, anyone who lives alone knows the constant annoyance of preparing a meal for yourself, economies of scale do not work in your favor when buying ingredients for one. The one meal I do always eat at home is breakfast. The bread in Germany is amazing. It's dark, usually has some sort of delicious seeds, and is nice and hearty. Each morning I go through the effort of toasting my bread in my oven, then smear it with some peanut butter and banana (of course). 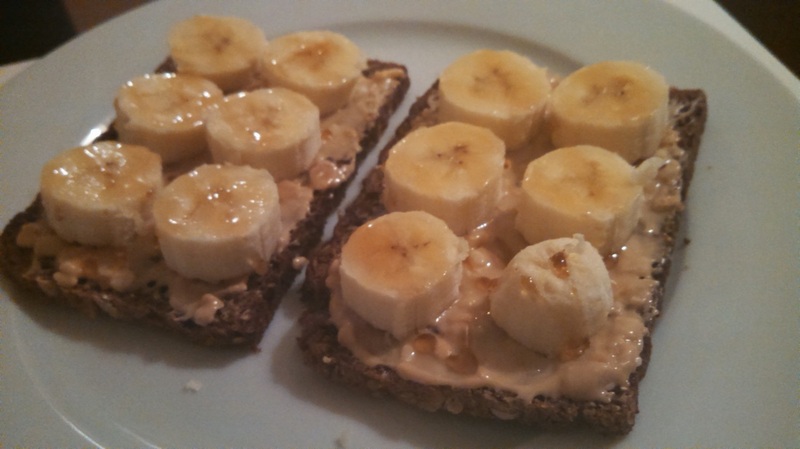 Europeans don't eat peanut butter, so I had to do some digging to find some. They usually have a small jar at the local supermarket, but it is the kind that has the oil added - I try to stay away from that. About a week into my stay here, I located a small natural foods store a few train stops away from my apartment that carries natural peanut butter. Worth the special trip! 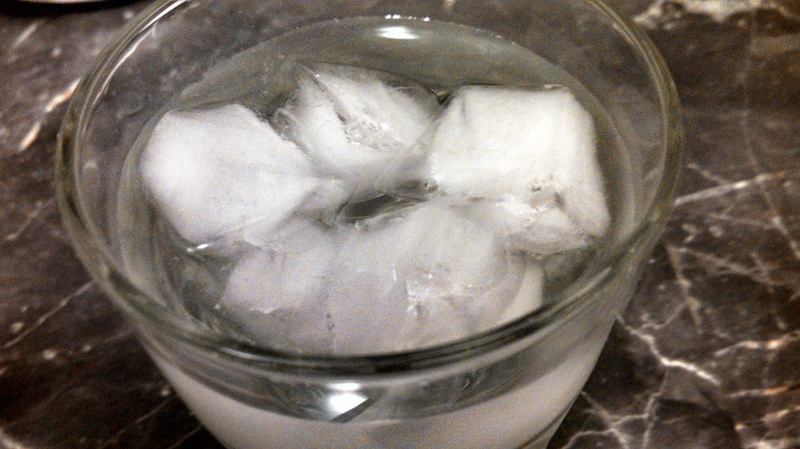 My other favorite thing to have in the morning is a glass of ice water. I know this sounds crazy, but I discovered during my first week here that Europeans don't serve ice in their drinks and I really miss it. I have one small ice cube tray at my apartment, and every day I refill it and have ice for the next morning. It's the simple things folks, haha. Another crazy fact - I usually like to have red wine when I'm having a drink with friends, but lately I have been ordering mojitos just so I can have a drink with ice. I had no idea that ice was such an obsession for me, I always took advantage of the fact that it was readily available everywhere in the US. 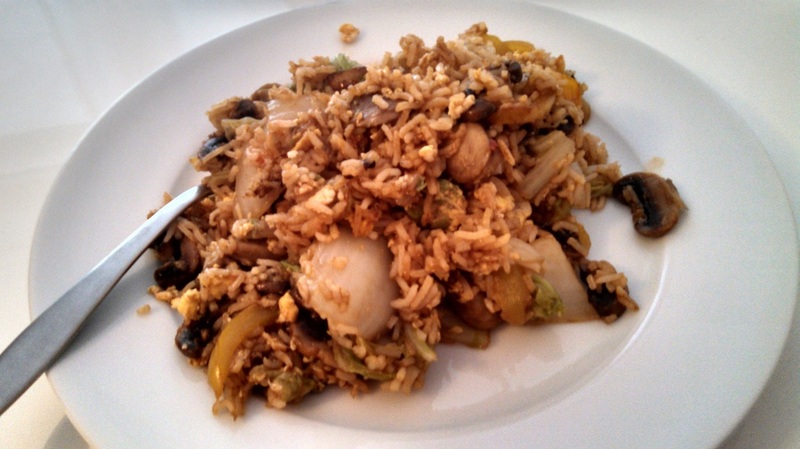 The most common meal I have been cooking for myself in my small kitchen is fried rice. It is easy to chop up some veggies, throw in some rice and soy sauce, and call it a day. It tastes pretty good too! I make my fried rice the exact same way as my fried quinoa if you are interested in the recipe. You can use whatever veggies you have on hand, this version had onion, Chinese lettuce, yellow bell pepper, and mushrooms. Now do you see why I titled this post International Food? I really haven't eaten much German food since I've been here. Hmm. Maybe I should try a few more traditional dishes? The problem is that most German food has red meat, and since I'm a flexitarian I try to stay away from the meat dishes. I have eaten chicken a few times since I've been here, and one meal I did have this week that I loved was Jamaican Jerk Chicken. There is randomly a Jamaican guy named Patrick that lives here in Stuttgart, he owns a small takeout place where he serves a different Jamaican dish every day. 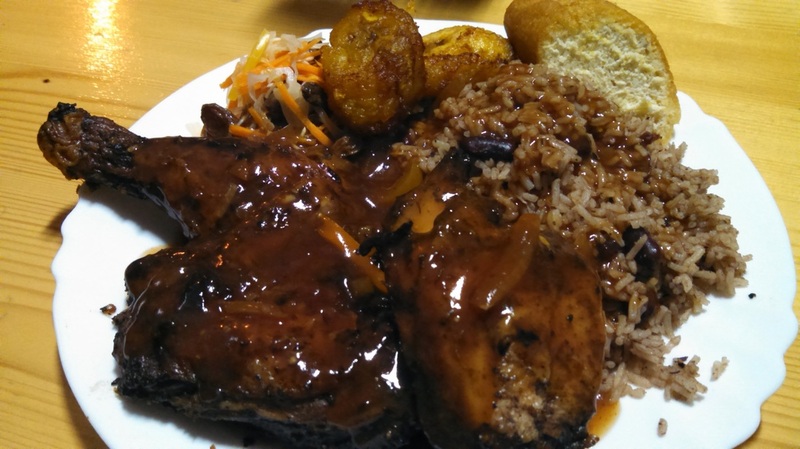 Wednesdays is Jerk Chicken with rice & beans, fried plantains, and corn bread. Mmm. It was yummy. 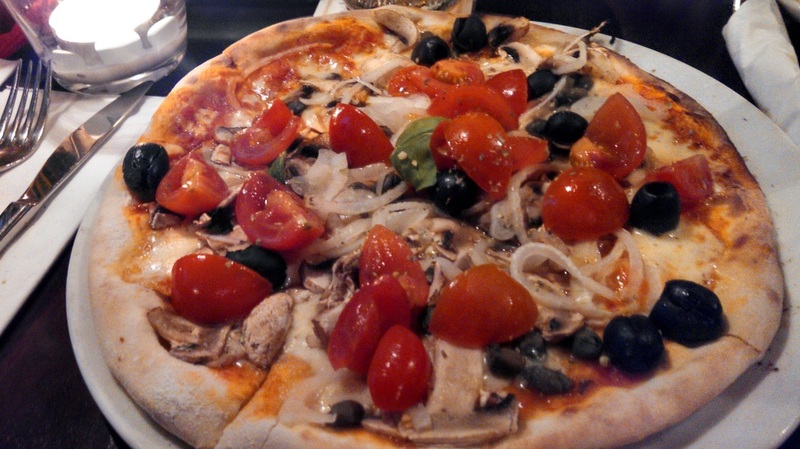 Italian food has also been on the menu, I had a delicious vegetable pizza at Il Pomodoro, I can't wait to try this place again and try a different pizza, they have a big list of specialty pizza options. Lots of toppings + thin crust is my favorite. I can't mention the international food experience without mentioning gelato, there are gelato stands everywhere here. YUM. 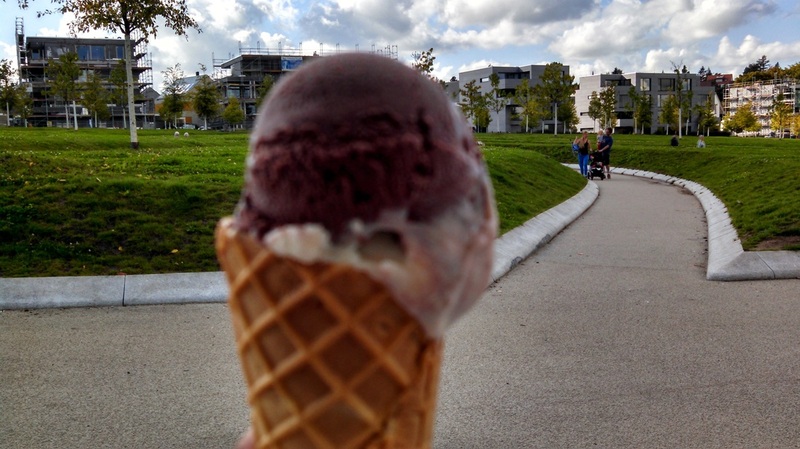 I feel like Germans are constantly eating ice cream, I have no idea how they stay so thin. Maybe over the next few months I will figure out what the secret is. I haven't discovered it yet - when I'm out jogging I barely see anyone else working out, and they eat bread, cheese, and butter like its going out of style. Until next time friends, after writing this post and reviewing my eating habits of late I'm realizing I should go do a serious exercise session!! Ahh, fall in Germany. That can only mean one thing- Oktoberfest! Whenever I tell anyone that I'm in Germany at this time of year - the first question I get asked is "Are you going to Oktoberfest?" Of course the answer is yes! Each town has an Oktoberfest celebration; the most famous one is in Munich. I didn't go to that one, apparently it is completely crowded and you need to book a table months in advance. Which of course I didn't do. However, the town I'm living in - Stuttgart - has a pretty big Oktoberfest too: Cannstatter Wasen. I have to admit, before I attended my first Oktoberfest I wasn't really sure what to expect. I knew that they served beer in huge mugs, and there was some sort of tent situation, but I didn't have a clear idea of what that all meant. 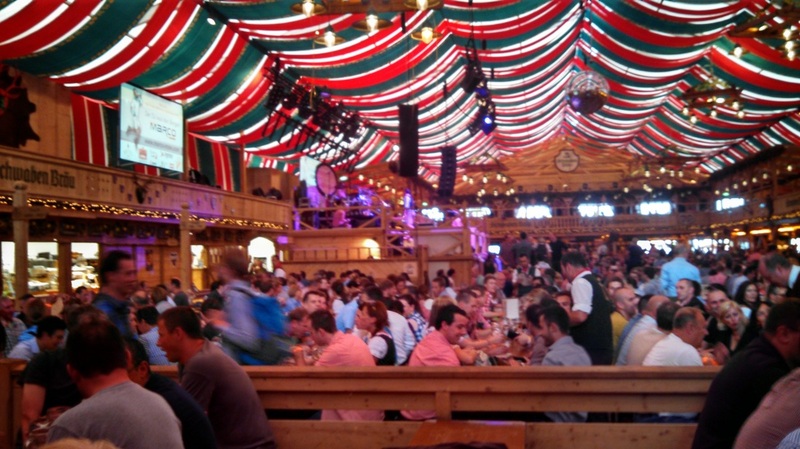 The Stuttgart Oktoberfest actually reminded me more of a carnival. There were rides, food stands, games, all the things that you would find at a temporary carnival in the US. The difference between a regular carnival and Oktoberfest however, is that there are also huge tents where they serve beer. 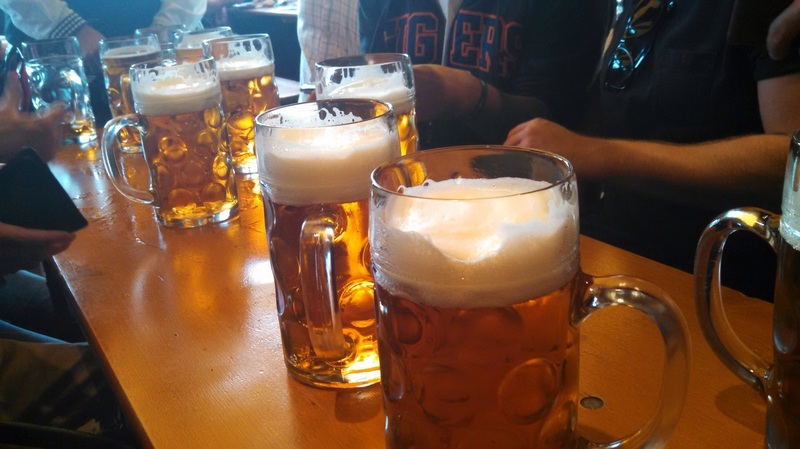 And the rumors are true; the beer is served in huge 1-liter mugs! It actually hurt my hand a bit to hold that thing all night, ha! 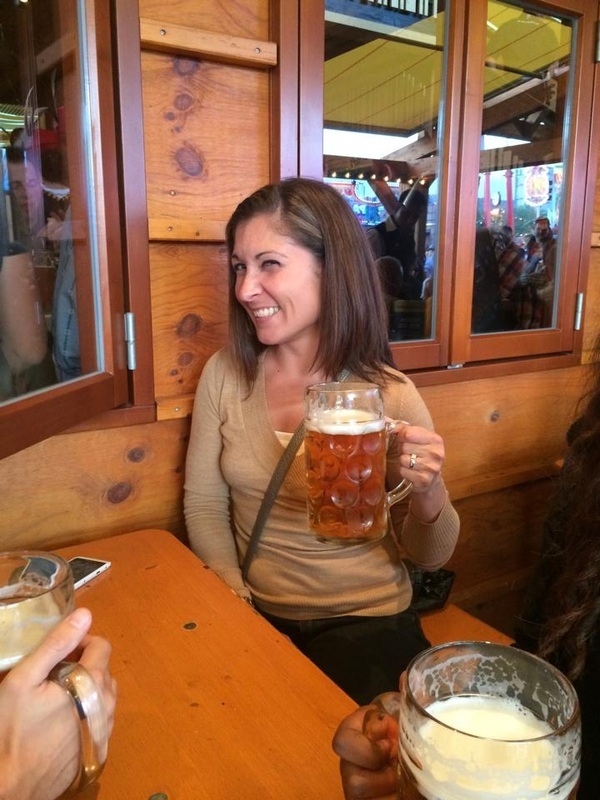 Oktoberfest was really fun because everyone sings, dances, and there are plenty of toasts. Literally almost every 5 minutes you are toasting with people at your table, people walking by, really everyone! Awesome experience, I'm happy that I got to be in Germany at this time of year. I have to say though, while it was fun getting the full-on cultural experience and having a few German beers, I am really glad to be back to red wine! And stay tuned, soon I'll share pics of my tiny apartment and some of the food I've been preparing for myself. Until then! Blogging from Charlotte, NC. 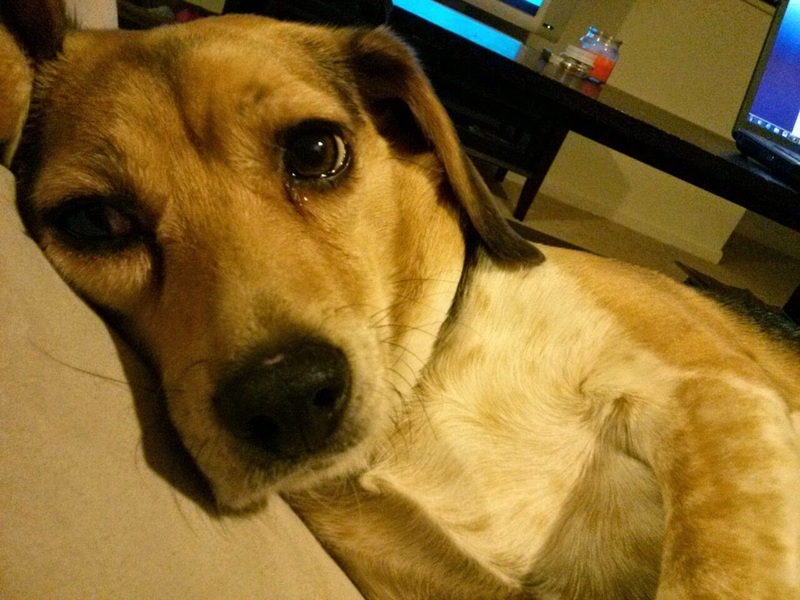 I am a wife, beagle owner, and have a full time day job, I love cooking (and eating! ), yoga, hiking, reading, and traveling. 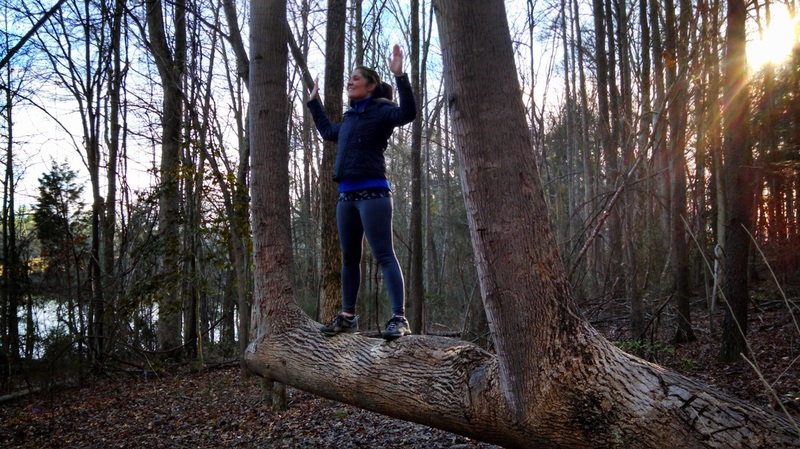 Follow along on my adventures as I try to balance having fun with leading a healthy lifestyle.